Yang Changfeng, the system's chief designer, has been vocal about his country's ambition to attract more overseas clients. "China's Beidou is the world's Beidou, and the global satellite navigation market is certainly Beidou's market," he told Global Times last year. When complete in 2020, it will have a constellation of 35 satellites to provide global coverage. This year alone, there have been more than 10 Beidou satellite launches - two more were launched this week. More are planned in what state media describe as a "period with unprecedentedly intensive launches". By the end of 2018, it will cover countries along the Belt and Road Initiative (BRI) - a massive China-led infrastructure and trade programme, part of what it calls the "Space Silk Road". Beidou already covers 30 countries involved with the BRI, including Pakistan, Laos and Indonesia. "There is certainly an aspect of this that is about expanding influence, but part of it is likely also about economic security," Alexandra Stickings, from the Royal United Services Institute for Defence and Security Studies, tells the BBC. A global navigation system that can rival GPS is a big part of China's ambition to be a global leader in space, Ms Stickings says. "The main advantage of having your own system is security of access, in the sense that you are not relying on another country to provide it. The US could deny users access over certain areas, for example in times of conflict." Currently, there are three other satellite navigation systems - Russia's Glonass, Europe's Galileo, and GPS - which is the most-widely used. So could Beidou really become the world's most popular system? "We are likely to see an increased bifurcation of the world into two camps - 'pro-China' and 'pro-US'," says Blaine Curcio, founder of Orbital Gateway Consulting, a Hong Kong-based satellite market research firm. "And from this perspective, those that go 'pro-China' may be more likely to be distrusting of US and EU satellite navigation services." But Mr Curcio adds that although the public in developing nations may benefit from having another sat-nav option, in general, there is "no real pressing need". 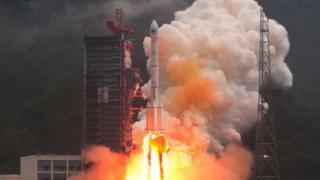 But despite its technological sophistication, Beidou has a supposed flaw - a two-way transmission process that involves satellites sending signals to earth and devices transmitting signals back. This can compromise accuracy and takes up more spectrum bandwidth. "Developing and operating a global satellite navigation system is very difficult," explains Brian Weeden, director at the Secure World Foundation. "It's one thing to get it working, it's another to keep it working consistently and create trust among users." "It doesn't just broadcast an accurate signal; it has done so without hardly any interruption for decades." Of perhaps more concern to Western governments is President Xi Jinping's strategy to develop a smaller, smarter military - and Beidou's crucial role in this. The army is apparently using Beidou for precision-guided missiles, reconnaissance exercises, and as a short messaging platform - something that GPS does not have. "There is no doubt of the benefits to the military of enhanced accuracy and an increase from regional to global coverage," Ms Stickings notes. "A potential benefit to the military could be in how it could deny or degrade the signal received by other users of the system."